The Koenigsegg Agera RS Draken? Yes it is, the exact details have not been published but we assume it is a "standard" RS with some custom body parts. 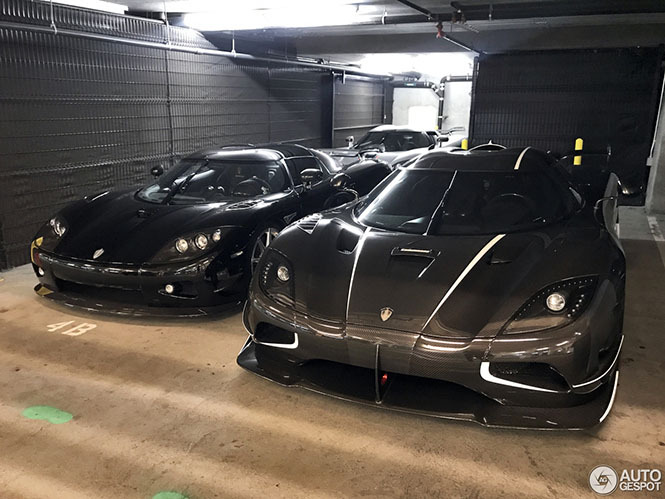 It is chassis number 137 and it was spotted at a hotel in Santa Monica, accompanied by five (5) other Koenigsegg cars. They are most likely heading towards Monterey car week, and the combination of these 6 amazing car will probably disrupt Ferrari's 70th Anniversary party. The Agera RS is a monster of a car and it will challenge the Bugatti Chiron in every single way. The new Koenigsegg Agera RS has its focus set firmly on the track but is still perfect for regular use on the road. It uses advanced technology developed for the Koenigsegg One:1 program, while maintaining all the functionality of previous S and R models. Such practicalities include a usable luggage compartment and a detachable hardtop that can be stowed internally for top-down motoring at any time. Agera RS enhancements include: advanced lightweight sound insulation, an all-new front splitter optimized for the track, front winglets, side skirts, advanced dynamic underbody flap system and a dynamically active rear spoiler for added down force (now up to 450 kg at 250 km/h). The RS also features improved side air outlets behind the front wheels, increased power and a raised rpm limit.